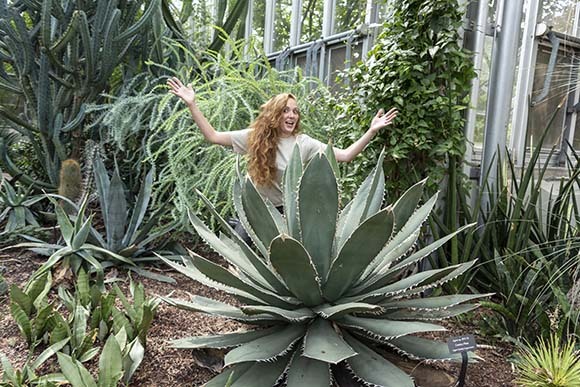 I recently was admiring one of the stately agaves at the Chicago Botanic Garden, and I had a genuine “I love my job” moment. This was not the first time and definitely will not be the last. I took a moment to reflect on that and why my job as a horticulturist is so much more than caring for plants. I started off as a seasonal employee in the production greenhouses, where we grow and tend for the plants you see throughout the Garden. Now I’m one of five senior horticulturists. My crew—horticulturist Dino de Persio and technician Evan Hydzik—and I oversee the three glorious display Greenhouses, all interiorscapes, two beautiful bonsai courtyards, event plant displays, and beyond. I also work closely with our creative design team to produce our annual Wonderland Express and Orchid Show. Some people ask me, “What is horticulture?” If you Google “horticulture,” this is what comes up: Horticulture (noun): the art or practice of garden cultivations and management. In my position, I am blessed to work with plants from all around the world. If you use a little imagination, these plants can transport you to new and exotic places. Many of the plants in our collection can link you to other cultures through their traditional, medicinal, ecological, economical, and ethnobotanical uses. For example, not many people know the showy bougainvillea is a traditional medicinal and culinary plant of Mexico and Central America. We also have bizarre bat-pollinated plants, such as the breathtaking jade vine (Strongylodon macrobotrys) and many Cereus cacti. Some of my favorites are the cardamom spice (Elettaria cardamomum), breadfruit (Artocarpus altilis), cocoa (Theobroma cacao), and coffee (Coffea arabica)—all of which are all edible, of course. Look at this plant I get to cultivate! This is the century plant (Agave americana). Our last century plant bloomed in 2010. When will this one grow through the greenhouse roof? You’ll just have to stay tuned to find out. Seriously, I love this job. One way to do that is to introduce the world of horticulture to young people and show them the critical role plants have in all of our lives. Earlier this year, Seed Your Future launched BLOOM, our first campaign to promote horticulture and inspire interest in careers in horticulture. 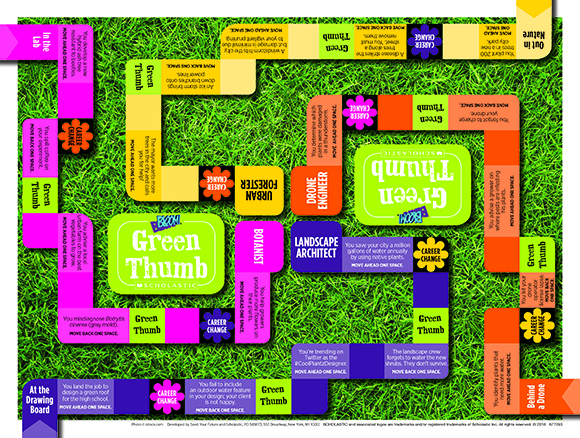 Download this fun game board and other engaging classroom materials at BLOOM! Our BLOOM microsite has fun games, videos, and more for young people to enjoy getting to know the world of plants. The amazing thing about Seed Your Future is that the website has an expanding bank of resources for parents, teachers, camp counselors, and mentors to use in their programs. All of this is free. I can say I would have loved a resource such as this along my plant journey, and I am honored to be a part of it now. Working with Seed Your Future has helped bring my story full circle. 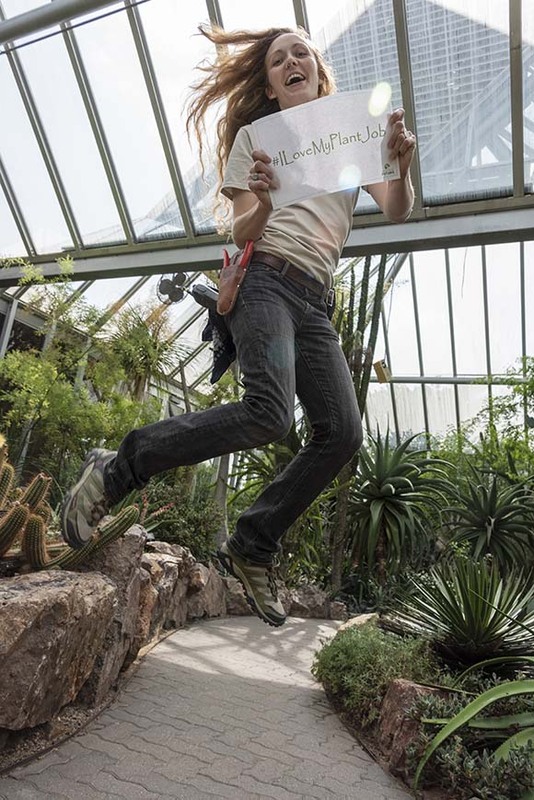 It has shown that my job as a horticulturist allows me to do so many fulfilling things: play with plants of the world, share knowledge and stories with others, inspire kids and adults, work with brilliant people, and ultimately get challenged and grow. Thank you for letting me share my “I love my job!” moments. Find your plant power at wearebloom.org; visit our Garden, and take part in our mission to cultivate the power of plants to sustain and enrich life.